Your SatNav for Public Transport. The first true multi-modal planner supporting all of Britain. 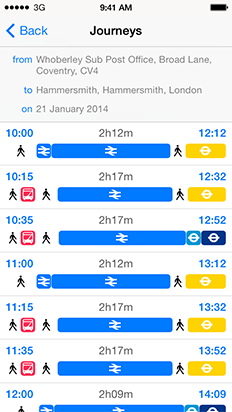 Buses, coaches, trains, trams, ferries, the Tube and more. Plan a journey without worrying about which operator to use. Use “Take Me To…” to quickly get you where you need to go. Plan in advance or use it while you’re out and about. Search for locations or pick them from a map. Choose your departure or arrival time. Save commonly used places as favourites. Instructions for what to do when. Makes it clear which service you’ll be catching. Shows walking time and waiting time. Know exactly where you should be and when. See your journey represented on a map. Displays routes for walking legs. Know when to get off your bus! The next services scheduled to arrive at a stop or station. Query the timetable of any stop. Bus numbers are prominently displayed. Note that this is timetable data only, not realtime. View the calling points of a service. 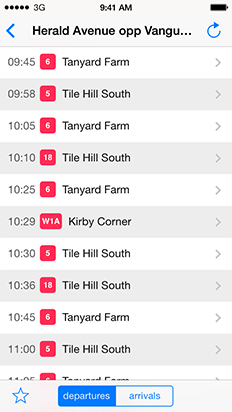 See how many stations you’ll pass before getting off. Find out where your bus or train will end up. 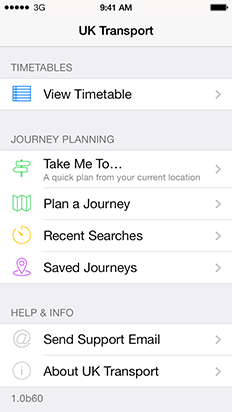 A journey planner in your pocket. There’s no need to panic when visiting somewhere you’ve never been before. UK Transport will accompany you, ready to get you out of a sticky spot. 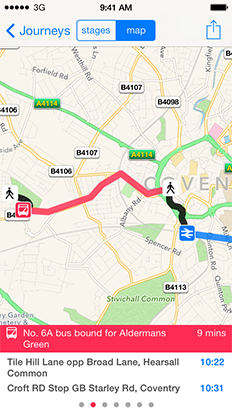 Using the public transport system of a strange city could be a daunting prospect, but UK Transport will tell you which bus stop to wait at, which bus to get on, and even provides a handy map to help you know when to get off. Not just buses, UK Transport supports coaches, trains, trams, the Tube, ferries, and more. You can see a comparison of different options for your journey, to help you pick the best one. Then, tell UK Transport to save that journey, so that you can come back and look at it while en route. What platforms does UK Transport support? 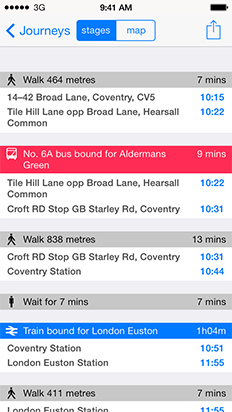 UK Transport is developed for iPhone, and requires iOS 7 or above. It will also run on iPad in scaled-up mode. Does UK Transport provide realtime data? Not at this time. All the data used by UK Transport is taken from the timetables. What regions does UK Transport support? UK Transport supports Scotland, England and Wales. It does not support Northern Ireland. Our support is based on data provided by Traveline, so we cannot support regions they do not cover. 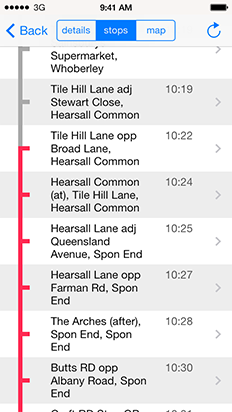 Who provides the journey planner? The journey planning service is provided by SilverRail. We don't comment on upcoming features or timescales. However, if you have any particular requests, please do and let us know. We welcome all feedback, comments and suggestions. If you're having trouble using UK Transport, take a look at the online manual. Follow us on Twitter at @uktransportapp. © 2014 Double and Thrice; all rights reserved. Please see our press page for company information and assets.